In 11 years on the job, Jason Smith has fielded his share of calls from people trying to get things out of the clothing donation bins he manages for the Developmental Disabilities Association. People sometimes drop keys and cell phones into the bins while donating. Other times, they call looking to recover sentimental items donated by mistake. But until recently, Smith had never been called about a person stuck one of the bins. But a human is just what firefighters removed from one of Smith’s bins at around 2 a.m. on Thursday. More specifically, he was a man in his early 20s wearing a t-shirt and boxers, but no pants. Looking dazed, he put on a pair of jeans, returned the clothing that has spilled out of the bin when he exited, picked up his skateboard, and walked away. “It definitely stirs up some conversation at the morning coffee time,” said Capt. Carol Messenger, spokeswoman for the Vancouver Fire Department, of the incident. 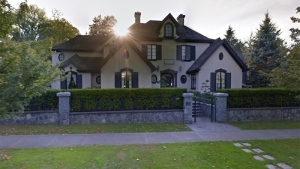 Passersby called 911 when they heard the man screaming from inside the bin in front of a daycare at 24th Avenue and Brant Street in East Vancouver. When they arrived at the scene, fire crews made sure the man wasn’t in any medical distress, then they advised him to stay as far away from the door to the bin as possible while they used specialized extraction tools to cut the lock and let him out, Messenger said. Neither she nor Smith had any idea how he managed to get into the bin, which has a door over the opening that makes it narrower than its full width at all times. Messenger said the fire department has occasionally gotten calls about people in donation bins, but usually they’ve taken refuge there by choice and can get themselves out. This is the first rescue from a donation bin that the department has had to perform, she said. The man was apparently stuck inside the bin for a total of three hours. Smith said the damaged bin was already being replaced by the time he spoke to CTV News on Thursday afternoon. He said the man had cost the charity “hundreds of dollars” by forcing it to replace and repair the bin he crawled into. The association makes roughly 20 per cent of its total revenue through clothing donation programs, including the bin program, Smith said. With a report from Shannon Paterson. 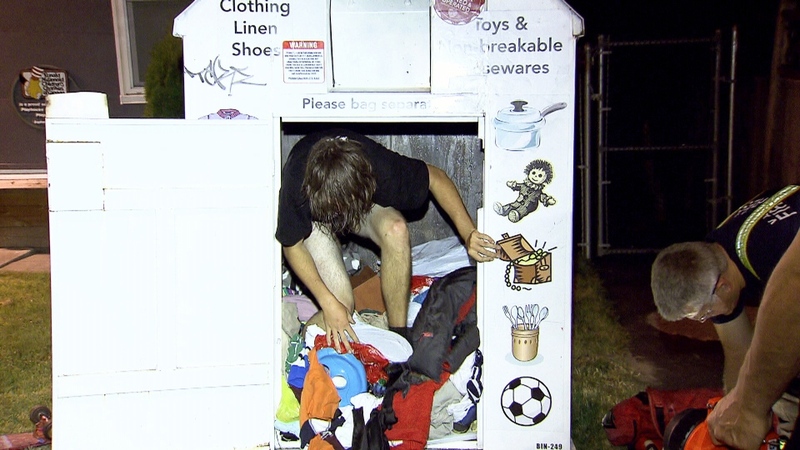 A man emerges from a clothing donation bin after emergency crews worked for 30 minutes to cut the container open on August 7, 2014.